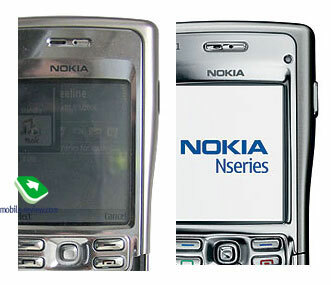 Nokia announced a new line-up, going by the name of Nseries in April 2005 – these devices we aimed to become the corner stone of the new handsets positioning concept. 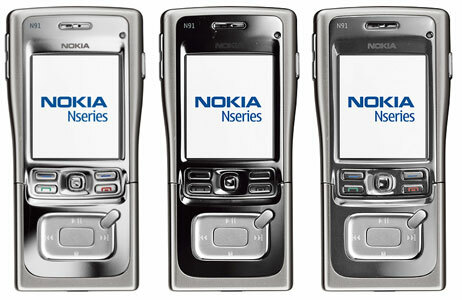 The company introduced three phones in the context of the first wave - N70, N90 and N91. The first model appeared to be a maximum approach to the existing smartphones, and as a result the most available of the new line-up. 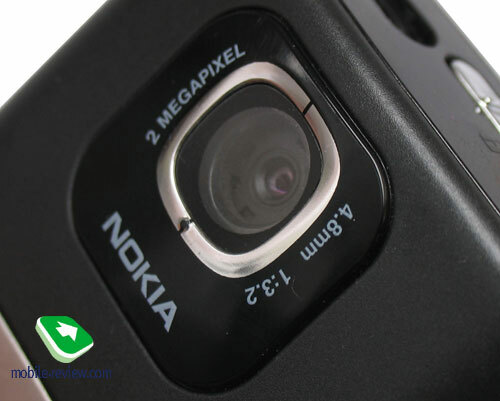 At the same time Nokia N90 was called upon to become the best photo-solution by the company, since it was the first device armed with a 2 Mpix camera. 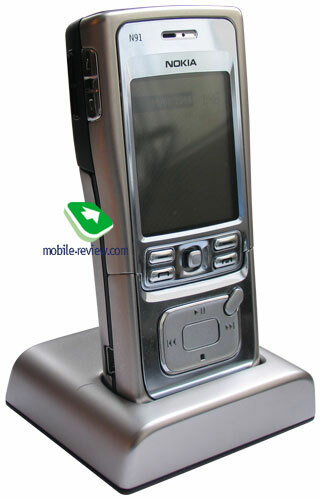 The novelty attracted pretty much attention and was met with enthusiasm on the market – in fact there were serious debates on superiority of glass optics by Carl Ceiss over a standard one incorporated into Sony Ericsson K750i. At any rate, one could draw a parallel between these two devices. 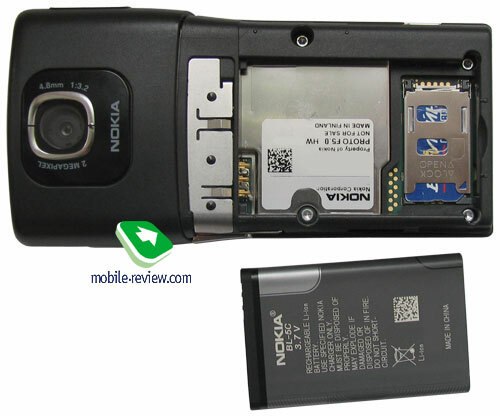 Nokia N91 was planned to be the first handset world-over with a hard disk onboard. 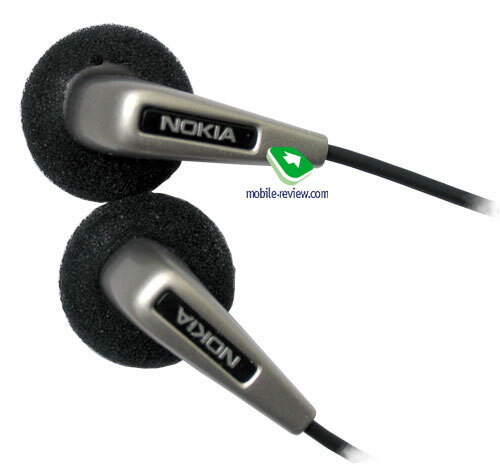 Considerable storage size initially moved the device to the category of music phones. That’s why the developers focused on this very function – all other capabilities were maintained on the level of other devices, and a bit later the company declined the idea of high-resolution screen, similar to Nokia N90, it was matched to the products of those times. On the whole, the handset turned out to be an innovative solution and drew the audience’s attention in a moment, so it got highly anticipated and discussed. A few manufacturers could boast of attracting such wide attention in a very short time span. Underestimation of Nokia brand has already cost many manufacturers dear, because frequently the slightest miscalculations resulted in decrease of sales volume. And once again, the brand loyalty of consumers to Nokia let the company delay release dates in order to achieve the desired functionality, stability etc. 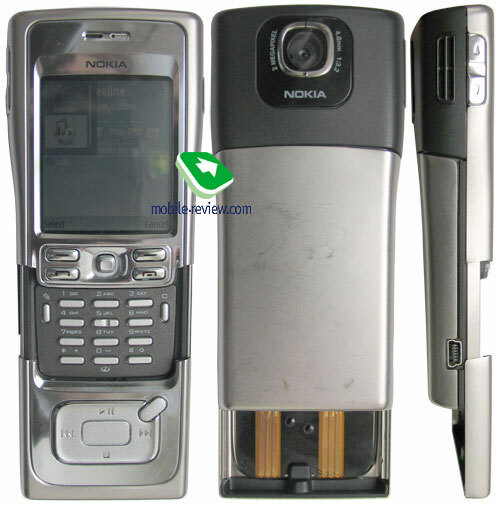 Nokia N91 followed this very route as well – the first announcement, made in April, featured the release date of the end of 2005, according to the intentions of the managers, this device had to become a hit of Christmas sales. However due to several technical reasons, the release was re-scheduled for the first quarter, and again in February the developers postponed the date, this time to the second quarter. These frequent changes gave rise to a number of rumors, according to which the model would hit the shelves in the third quarter. Noteworthy, that in the very moment when the general public discussed the product’s further destiny and its release dates, the company launched the production (it has happened just now). The sales start is scheduled for April, though retail stores will get the device shipped only in the end of April – beginning of May. That’s why many will have a natural question, whether the model is released in due time. As a matter of fact, 4-5 months in the conditions of the modern market of the mobile devices is a long period, which often defines knockout of competing models and price brackets shifts. As to me, having changed the product’s price, the company has secured its attraction. At the same time, the potential of this solution is very high, so it can be considered as the first sign of a whole new line-up of smartphones armed with hard disks. 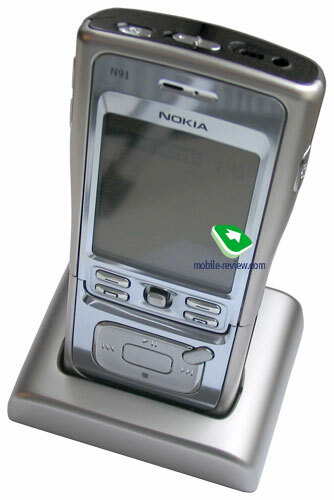 Involuntarily this can remind of first the Symbian representatives, Nokia 7650 in particular. It may seem strange enough, but this handset is still in use. 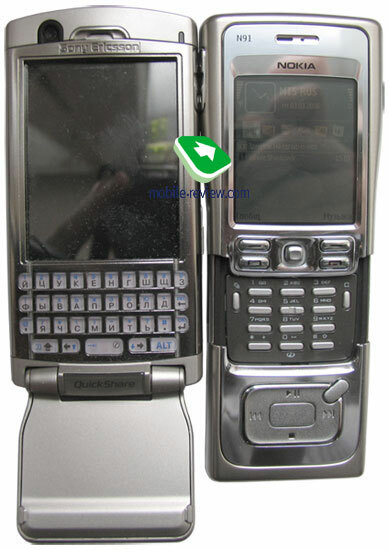 Curiously, that the release of a direct competitor of this model, Samsung i300 was called into question more than once, as the company didn’t want to introduce a weaker solution at one time with Nokia N91. In this case, direct comparison of specifications resulted in a huge loss of Samsung’s device. Postponement of Nokia N91 release date played into Samsung’s hands – the sales of Samsung i300 were rather good for its price bracket, thus the company managed to claim the title of the first manufacturers which introduced a handset with a hard disk to the European market. Two variations of the models, design, display, life time. Starting with Nokia 6680, the company has preferred making two versions of its smartphones at once, in order to aim one at GSM networks and the other – at UMTS. 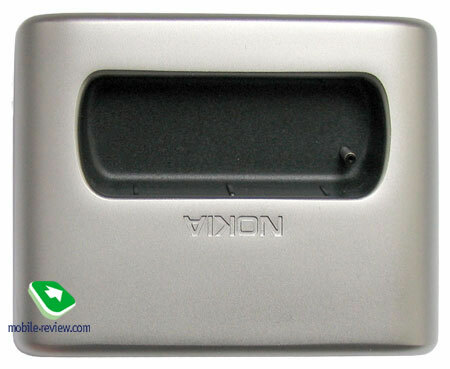 And this case isn’t an exception, since the manufacturer announced only model Nokia N91-1, though many documents feature its analogue, Nokia N91-5, which lacks UMTS and WiFi support. Additional announcement of the second model isn’t stated in the company’s plans, as it will just be released when the initial demand for Nokia N91-1 goes off. The difference in price will be around 50 Euro, and that’s really nice, though not critical in this category of handsets. In the future the same strategy can be applied to all other most interesting smartphones of the company. The model has a distinctive design – it’s one of a few devices made almost completely out of metal, as to our case, we have to deal with stainless steel. Metallic coating doesn’t cover only the rear part, to be precise, the area near the camera, in light of the fact the antennas are located right here and any kind of metal shields them. 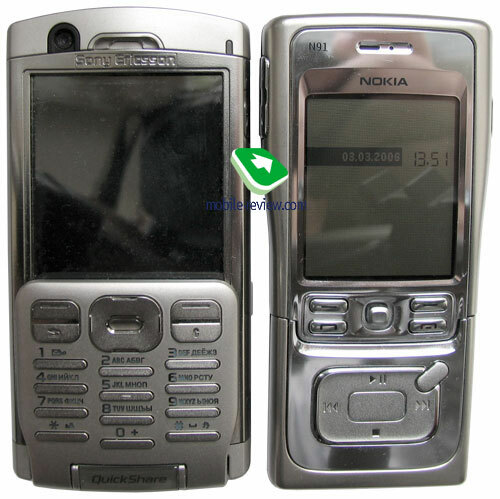 Despite Nokia 8800, which features stainless steel as well, in this model it is not polished, but matt. The phone doesn’t flash and looks pretty solid, but on the other hand this conceals a real problem of abrasion. 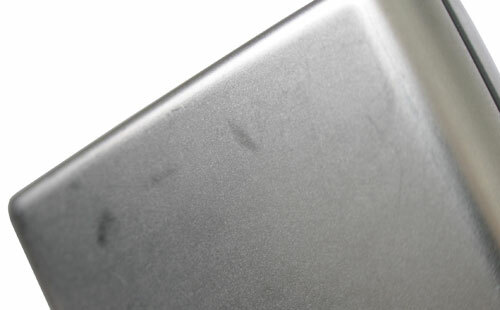 All scratches are visible on the shell and the fact it’s not polished only intensifies them. And here one can see a reversed situation, when during daily routine the device keeps “polishing” itself. Even though the shell itself is long-wearing, the esthetic side of the appearance suffers a lot. In my opinion, after 6-7 of intensive use, all abrasions will become visible. In the first place the developer announced three color solutions – silvery, black and grey, although all these differ only in screen’s edging and the music key – the rest parts are completely equal. At first the device will appear in silvery version, the black one will be released later on, and as regards the grey solution, its destiny is doubtful, and it’s more likely not to be introduced at all, as it looks very similar to the silvery variation and maybe this is the main reason of cancellation. 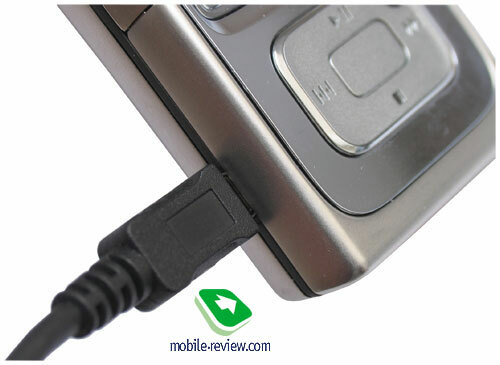 Attentive readers can note that all official pictures of Nokia N91 feature a light indicator, located under the screen on the right, however our device doesn’t have this bar. 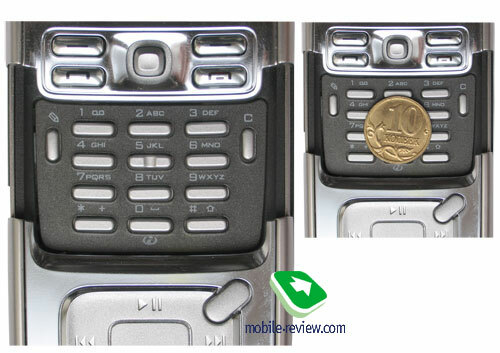 Moreover it’s not present in the handset, presented at FCC certification, and this let us make a conclusion that this indicator isn’t incorporated into serial models – in fact it’s not essential there, since the keyboard is covered by the sliding part with music keys, opening of the panel automatically activates backlight and owing to the fact the buttons are deepened, the backlight is required in most of the cases. On the other hand, all music keys don’t need backlight, and, among all other things, the indicators slightly, but still increases energy consumption. When closed, the device practically doesn’t have any gap at the bottom – it’s insignificant and refers to the peculiarities of the design. One can move the panel with music keys using only one finger, as it easily slides, even taking into account absence of auto-completion mechanism – what really makes it so easy to open it is small size of this part itself and minor weight. Owners of small hands may experience certain difficulties with closing the device, since it’s pretty challenging task to take a finger aside so far (the full height of the opened device is 14 cm). If you take a look at the rear side of the sliding panel, you can see the plastic base of the music case and also several wires, since they are not covered. Such solution materialized as a result of weight control, because its mass is already quite considerable. Actually this model has some paradoxes, as it somehow combines a base solution with certain dimensions and a hard disk, which requires reliable methods of cell protection. By the way, the weight of the hard disk itself is only 13 grams, as you see, it doesn’t significantly affect the overall mass of the handset, though the shell does. Use of metal parts and strengthened gears are forced steps, taken in order to protect the disk from falls, shakings and vibrations, rather than a fresh designers’ idea. We’ll cover this question more elaborately in the section, devoted to the hard disk, and now let’s get back to the shell. The total weight of the device is 164 grams – it exceeds the standard mass of 110-125 grams, residing in this type of devices. Judging by this parameter the handset can be named typically male one, though not all men will find its weight acceptable, as the fashion type of models is also represented by Nokia 8800 and senior handsets of this line-up. Strictly speaking, functionality of the device is the only factor, which can force one to shut his eyes at the weight. I would like to note however, that the weight is one of its most critical disadvantages – women won’t find this handset suitable for sure, since their feedback was mostly negative due to weight factor. Measuring 113.1х55.2х22 mm, the smartphone appears to be larger than all other devices of this category, but it is bearable. 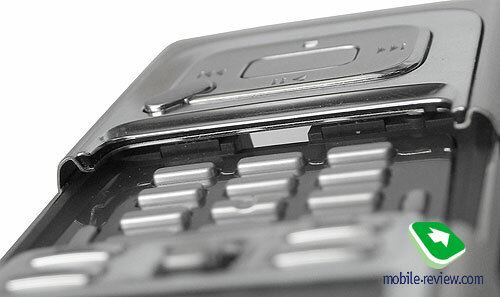 The bottom part of the shell has the thickness of around 18 mm, though the camera’s module takes up 22 mm – these dimensions stress one more time the fact this handset is aimed at male audience. Assembling quality is quite good – there are no evident gaps between the parts, though the early prototypes weren’t lacking these flaws. 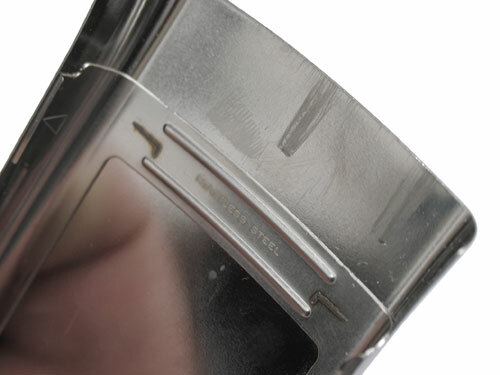 The weakness of the design is the key lock button, located on the upper side, since as with time it becomes rickety – if you shake the device, you’ll hear how it shifts in the slot. Fortunately there are no other creaking details – actually there couldn’t be any due to metallic covering. I should warn you in advance that critical dimensional features between parts can be up to 1 mm – these are structure peculiarities rather than flaws. However, you can always examine the assembling before purchasing a device. The functional keys are made in a traditional style and are quite convenient in use. 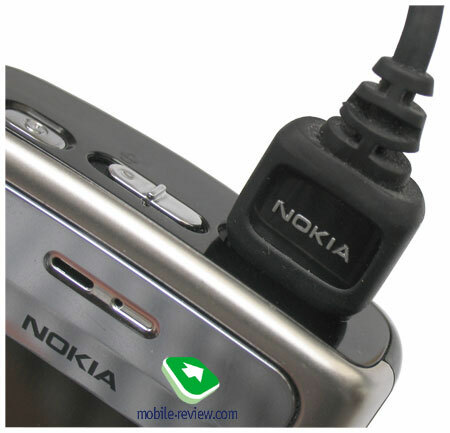 The five-position joystick reminds of the same in Nokia 6820 in many respects, and it’s just as good in operation. 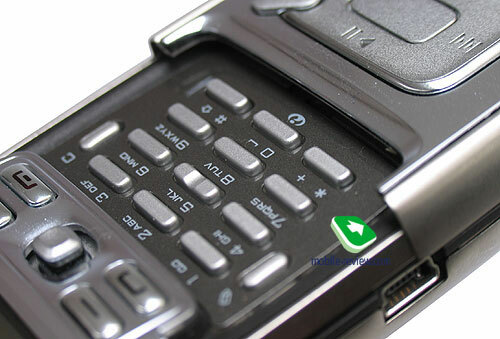 Having pushed the panel with music keys, you will see the alphanumerical keyboard, which has blue backlight. All symbols are engraved near the buttons and well-distinguishable; even though the buttons themselves are pretty compact and dense, you won’t experience any negative feeling while working with them; the only thing you should keep in mind is that buttons have to be pressed with your finger-tips. On the whole the keyboard leaves favorable impressions. The display, featured in the devices meets the standards of six months’ prescription, when QVGA screens were considered as innovative solutions. The resolution, featured in the device is 176х208 pixels (35х41 mm), the screen is capable of displaying up to 262 K colors (TFT). The display’s specifications are fair, though putting it lightly, they are not acceptable for a top-model, which used to be a leading device. The screen doesn’t fade in the sun, information is easy to read. The back panel of the device features a module of 2 Mpix CMOS camera, which is equal to the ones in the other models. The characteristics of the camera are average – it’s only capable of providing fair quality of photos and nothing more. 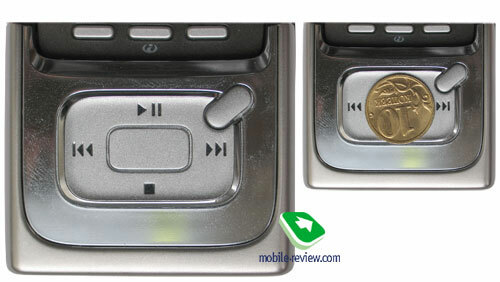 We have left uncovered only control elements in this review – the left side features a double key of volume control and the loudspeaker next to it, which is very loud, and despite the one incorporated into Nokia 3250, a bit more powerful. Near the bottom edge one can find USB-connector. The right side hosts the Menu key – this is pretty convenient when you need to work with the phone one handedly, as there is no necessity in the numeric keyboard. Though it’s notable, that in order to use the device with the help of only single hand, you have to be a lucky owner of really big hands in the full sense of this word. On the upper part one can find the power button, key lock bar and a standard 3.5 mm headphones cutoff point, which is combined with the control console connector (also included in the package). The sliding half at the bottom features the microphone – due to considerable length of the shell it’s as close to the speaker’s mouth as only possible, that’s why it fairly reproduces the voice. The idea of a cradle would have been realized really well, if only the developers had incorporated a synchronization cable into it. 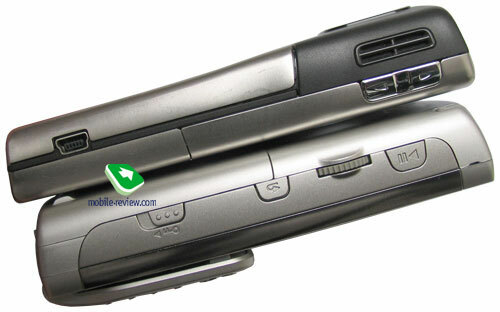 It’s obvious that the user of Nokia N91 will have a certain PC, from which he will upload content and music. And besides these technical issues, a cable near the cradle looks slovenly and leaves an impression of incompleteness. The prehistory of Nokia N91 release is rather interesting, as it is the first device armed with a hard drive, though initially it had slightly different specifications – at first the disk was capable of storing only 2 Gb of data, however the announcement of Samsung I300 release confused this intention. As a result on the 27th of April the journalists were shown working prototypes, but with 2 Gb hard drives. Literally in the very last moment the company took a decision of arming the handset with a 4 Gb disk – back then, it was the maximum capacity of this hard drives type. Those, who are fond of digging in the internal part of phones, will be surprised by the fact that the hard drive, featured in Nokia N91 has the dimensions of 32х24 mm, rather than the standard 42х36 mm. 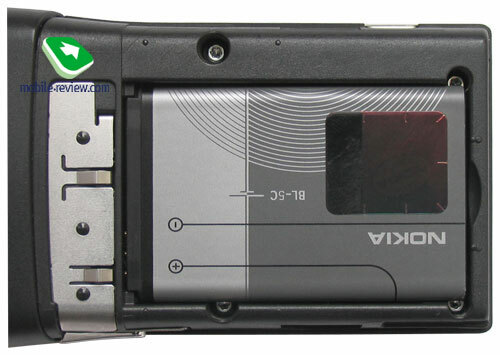 The explanation lies in use of CompactFlash II connector by most of the companies, incorporating Microdrive disks into their solutions, though Nokia declined the idea of using a disk in the standard shell. 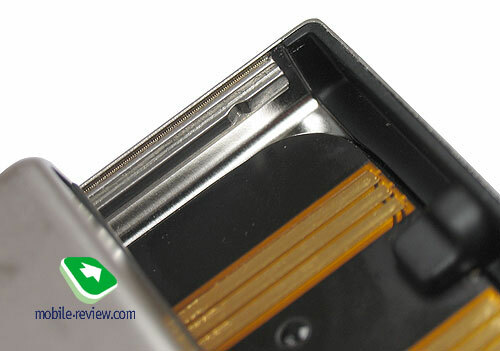 It means that the hard drive, presented here is an analogue of Microdrive 3K4-4, but it differs in shell, which was replaced by a special socket on Nokia N91 chip (located lower than the camera’s module, but above the battery, exactly under the safety casing). The developers applied here not only floating support for the disk, but also a special casing, which amortizes all blows. From above the disk is also protected by a soft rubber cover, which deflects frontal blows and lowers noise level at the same time. To tell the truth, one can rarely hear the disk itself – only in cases when you hold the handset in your hands do some inhumane experiments, e.g. open the rear lid and instantly pull out the battery. The interface connector is designed specially for this model and is aimed at lowering the place, occupied by the hard drive. The cover has a pressure sensor, so once the battery's cover is removed, the disk automatically turns off. This process takes up to one second. Another precaution is acceleration sensor – in case the device is falling from a height more than 1 meter, the hard disk switches off, so it may avoid a certain amount of damage, since exactly when turned on, the disk is vulnerable to mechanical effects. For good reason we didn’t try to carry out stress tests, since all throws could hurt the screen, rather than the hard drive, because protection level featured in Nokia N91 is higher than in all other devices using Microdrive. There are some numbers regarding durability of iPOD Mini – after a certain period operation most of devices work fine, and no wonder about it, as here the developers also used the system, applied to N91. Temperature conditions, stated by the manufacturers are 0-70 degree centigrade. At the same time the User guide features the fact that one should observe the temperature conditions, otherwise the hard disk will just switch off, though no exact numbers are stated. Taking into account Russia being a country with cold climate, we decided to test the model in the conditions of temperature below zero. In order to carry out this test, we used a freezer with the handset inside it. At five degrees below zero the device worked without any visible errors – it kept playing back music and even didn’t turn off. At -10 everything seemed to be the fine, though at twelve degrees below zero, the phone refused to work with hard drive. In practice this means that the handset endures any winter conditions and temperatures, as you will carry it only your pocket. However the shell remains very cold – metal is metal anyways. Each manufacturer tries to tie the amount of external memory to a certain number of tracks which can be stored on the handset. At this they make a footnote that all calculations were carried out on the basis of some exact length of each track etc. The reason of all these complicated actions is concealed from me, since stating storage size is already more than enough. I doubt whether many remember how many space requires this or that album or all tracks in sum. In short, there is no need in providing users with such information. Energy consumption is an essential parameter for a hard drive and here Nokia N91 is riding high. It was very easy to check how much time the device will last with network part turned on and constant tracks playback. We uploaded around 900 songs with mp3 extension, which totaled 3.7 Gb, set them for random playback (this prevents cache buffer use), plugged in headphones and adjusted volume to the middle. In these conditions the device managed to work around 10 hours and this is really worthy performance, comparable with most of the modern MP3 players life time, which use the same hard drive (e.g. Creative MuVo2 4Gb with announced 14 hours of life time, though in practice it lasts not more than 11-12 hours). The hard disk menu now features a special item, which is titled on default volume of free and used space. Among additional options we should note a possibility of naming the disk, defragmenting it, scanning for errors (the two latter options require the charger to be plugged in, in order to prevent any malfunctions). Disk scan may take up to 25 minutes. The other options feature full disk format – on default the drive has FAT16 file system applied. Using PC, one can relabel the disk, though it’s not worth doing, since you’re risking to corrupt several sectors, so they won’t be recognized by the handset. The disk in N91 is marked with E letter – absolutely similar to flash memory, since there are no differences in accessing these two storage types. We’ll talk about working with memory in the next paragraph.